Do you know how to take a screenshot on your PC/notebook when you want to capture the important or wonderful moment and share it with your friends? If no, don’t worry. This post will tell you how to take a screenshot on Windows 10. Just read on to follow the instruction. As we know, using shortcut key is a good choice to turn on some features quickly. There is also a button for screenshot on the keyboard, which is printed PrtScn or Print Screen. It is different on different keyboards. Now let’s see how to use shortcut keys to take a screenshot on Windows 10. Then the whole screen will be captured and saved in the clipboard (not be saved as a file). You need to launch an image editing program like Paint and paste the captured image from the clipboard to save it as a file or to edit it. The whole screen will be captured and saved as a file in the Screenshots folder under Pictures. Only the currently active window will be captured and saved in the clipboard. Note: If you are using a laptop or a keyboard with the Fn key, you need to press Fn together with these shortcut keys. 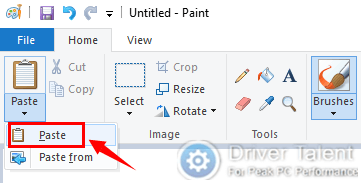 Snipping Tool, a screenshot utility built in Windows 10, can take screenshots of an open window, rectangular areas, a free-form area, and the entire screen. You can type “Snipping Tool” in the search bar to find it. Then launch it and click New to start your snipping. As you can see, there are so many methods to take a screenshot on Windows 10. Do you get them now? Feel free to leave comments below if you need further assistance. More solutions to other computer issues like no sound, blue screen, black screen or microphone not working can be accessed on the Resource Center of Driver Talent’s official website.